Get out your pocket protectors because geek-chic cardigans are on the checklist for fall. Worn shrunken, chunky, classic or striped this season, cardigans are the perfect transition piece to make over your summer favorites into winter wear. One caveat – steer clear from buying extremely baggy styles or you’ll end up looking more fuddy-duddy than fashionable. The shawl collar adds sophistication and drama to a basic wardrobe staple. This purple Martin + Osa style allows you to button up for the work day or let loose and layer for a cozy weekend look. 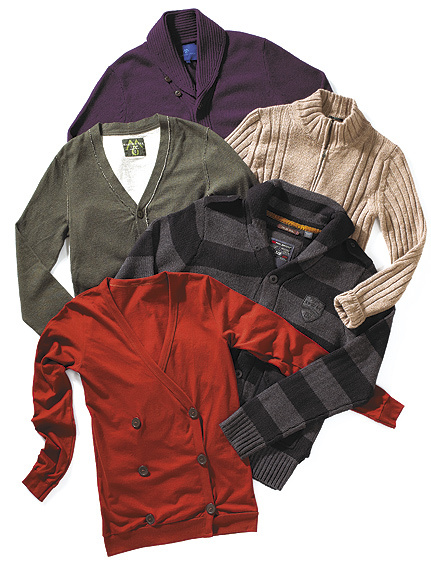 Sturdy, knit styles are the perfect remedy for Minnesota’s colder temps! The fitted shape and versatile color of this cardigan would look great worn over almost any color button-up, plus the easy zip-up closure also makes this a must-buy. This relaxed woven is a great option if you’re looking to jump on the cardigan bandwagon but prefer more casual, sporty styles. The raw edges and jersey fabric are a perfect mix of comfortable and cool. Channel your inner Harry Potter in this striped sweater option from Metropark. The crest-style patch appliqué is an excellent added detail in addition to hand-warmer style pockets perfect for carrying all your potions. Definitely not meant for wallflowers, this double-breasted cardigan from American Apparel is a great twist on a basic look. Made out of 100% fine jersey cotton, this funky style is also available in numerous other colors including basic black, Sahara brown and charcoal. Onward Style is Lavender’s exclusive column written by Sara Rogers, MOA® Trend Specialist. Sara has worked in the fashion industry for more than 20 years as a model, fashion specialist, wardrobe therapist, and television host. As the Trend Specialist and Personal Shopper for Mall of America®, her “office” spans 4.2 million square feet and more than 520 stores, providing her with extensive resources to research what’s hot in retail trends.